Nelson’s Sage landscapes is run by former Bristol native Ollie Sage, who worked on a range of projects in England from highend small domestic gardens up to multi-million pound contracts and award winning gardens at Hampton Court and Chelsea Flower Show. Nelson’s Sage Landscapes, designs and builds outdoor spaces with creativity and bravery, offering unique and individual gardens for people to share and enjoy. 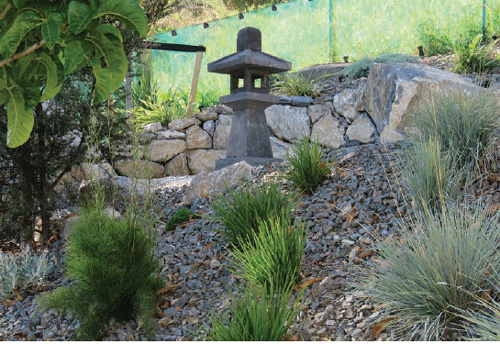 Having owned and operated Sage Landscapes for three and a half years, Englishman Ollie Sage is getting to know our native plant varieties, different construction methods, and also a whole new vocabulary of technical terms. “England is so much ﬂatter so we don’t often have to build on poles or use retaining walls,” he says. “When I walk into a builders merchant here, I often have to describe what I want!” Ollie has more than a decade of experience having learned his trade from the roots up in England where he worked on a range of projects from highend small domestic gardens up to multi-million pound contracts and award winning gardens at Hampton Court and Chelsea Flower Show. He ran his own landscaping company in Bristol from 2009 until he emigrated to New Zealand in 2012, where he became a project manager for a high-end local landscaping company before setting up Sage Landscapes. Sage Landscapes has grown considerable since, having started with just Ollie, a Hilux, and a trailer to a staff of four, two tipper trucks, and the very recent purchase of Ollie and his partner Sarah’s new 1.5 acre property. “This is where it gets exciting,” Ollie says. “This space is going to allow us to bring in bulk deliveries of items so we can keep our prices competitive, and develop a little nursery so we can grow the types of plants we’d like to see more of. Sage Landscapes offers a full design package, with both Ollie and his latest import Matthew Stewart fully qualiﬁed and well experienced in landscape design and planning. “What we bring to our clients is a bit of bravery,” Ollie says. “We’re not reinventing the wheel but we’re showing our clients they don’t have to do what everybody else has done. “Sections are large in New Zealand which gives you the option to divide them up into different areas. Ollie is a landscaper and not a business developer, so he is receiving business coaching and mentoring to help him handle his growing business, keep it secure for his staff, and give back to his community. Ollie is looking for local suppliers to join him in providing a regular garden makeover service for free for deserving locals in the next couple of years.